Gui Gu Zi’s Strategic Persuasion is about developing strategies and persuasion to complement each other for winning together. The strategies and tactics for maximizing your persuasive power are covered comprehensively in this Chapter 9. 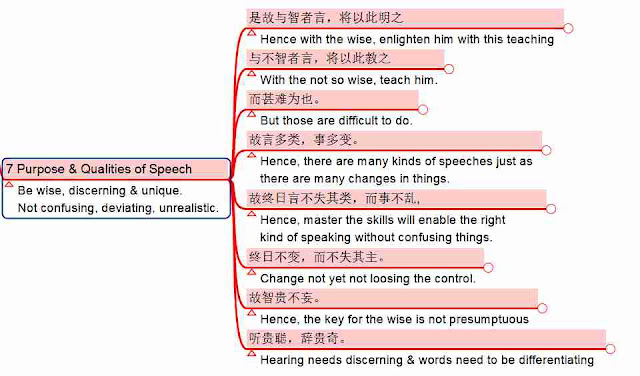 The key principles are covered first and the English translations of the original text are given in mind-map forms subsequently. 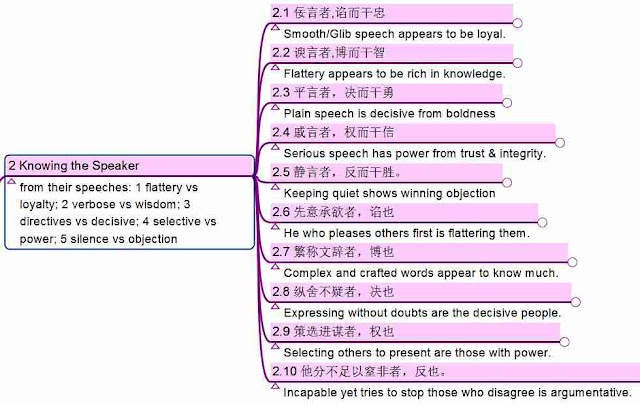 By studying the translations, you may be able to come out with additional principles and tips to increase your persuasive power. Hope you can share with us too. The following mind-map captures the principles and key points for maximizing your persuasion. it begins by pointing out that persuasion is not just about us but more about the listener. Why should they listen to us? We must earn the rights to be heard. 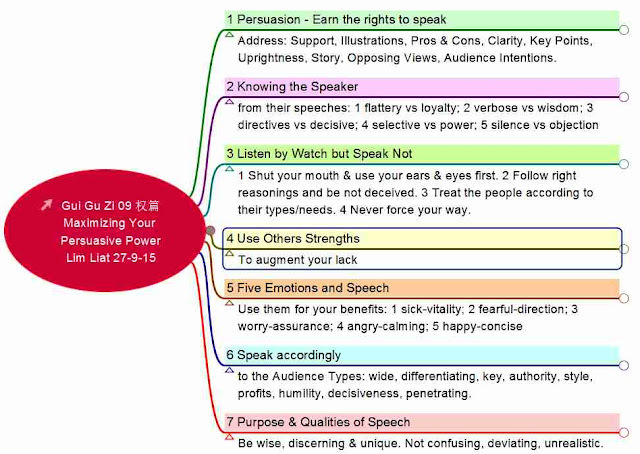 Please go through the map below and see if can follow them to improve your persuasive power. Want to go further to discover for your own? 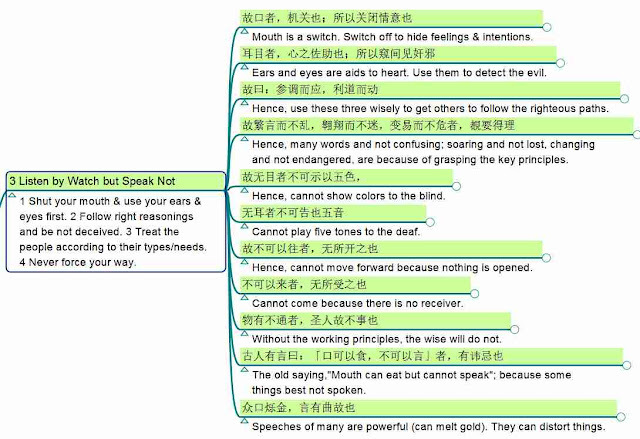 I may not have discovered all the wisdom of Gui Gu Zi and so I present my translations of his original text below for your own study and learning, please remember to share with us your additional discovery. Be aware of the listeners’ emotion. A person that is angry is not going to listen to anything. 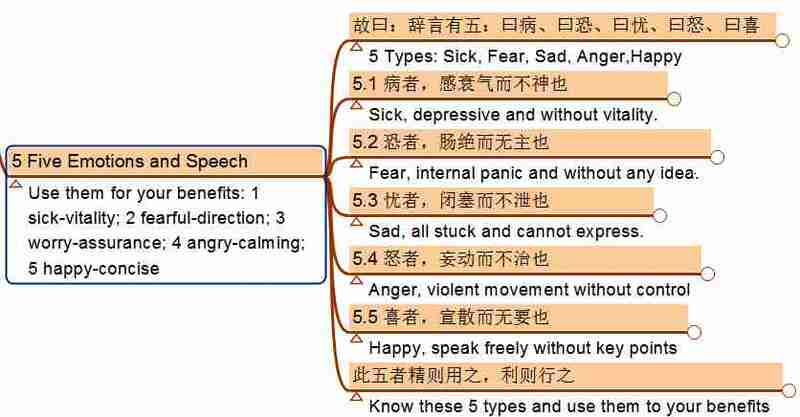 Need to calm them first and help them into the right emotion and mental state to listen and support what you are proposing. A final checklist to reflect on what you want to say. Are you addressing your audience rightly? Do you have any worthy things to share with the wise or new things to teach those that know not? How are you saying it and the words you use, do they create surprises and curiosity? As an example, “The differences between male and female” is not as attractive as “Man are from Mars and Women from Venus”. 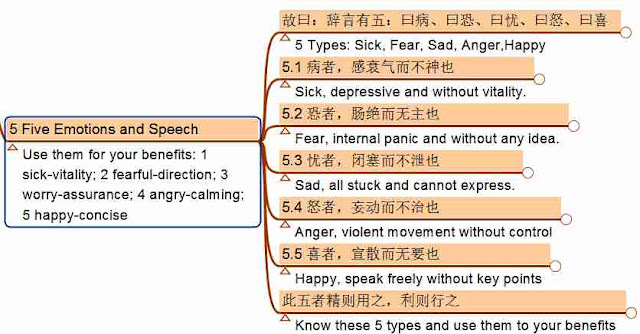 Sima Guang, a famous Chinese Historian and a former Primer of the Zong Dynasty, gave as two sets of three key principles, one on personal development and the other on running successful organization. 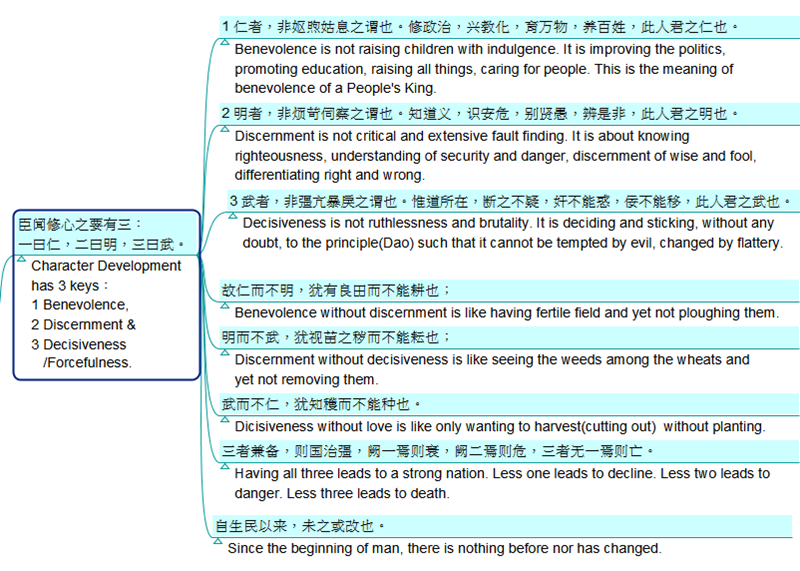 This wisdom is distilled from the study of the rise and fall of nations and leaders in China from 403 BC to 959AD. It was written as a guide for the King to rule the country well. 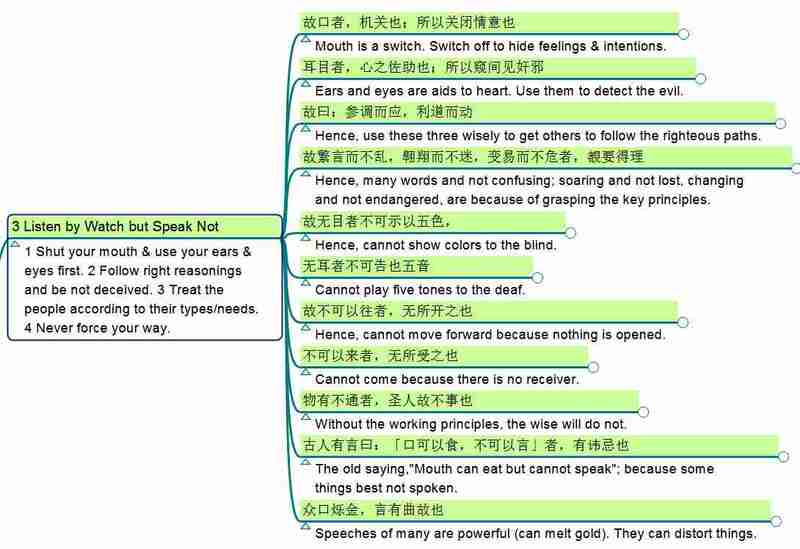 The famous history book written by Sima Guang is The Zizhi Tongjian 资治通鉴, literally in English is, “Comprehensive Mirror in Aid of Governance“, or in my translation, “The CEO Handbook”, since it was writtent as lessons for the rulers. It is published in 1084, in the form of a chronicle. In 1065 CE, Emperor Yingzong of Song ordered Sima Guang (1019–1086) to lead with other scholars for the compilation of a universal history of China. The task took 19 years to be completed. It records Chinese history from 403 BCE to 959 CE, covering 16 dynasties and spanning across almost 1,400 years, and contains 294 volumes and about 3 million Chinese characters. Sima Guang gave his evaluation for the reasons for success or failures throughout the chronicles. Most kings through the Chinese dynasties had recommend the study of the book. Even Chairman Mao of China has recommended it as well. Benevolence is not raising children with indulgence. It is improving the politics, promoting education, raising all things, caring for people. This is the meaning of benevolence of a People’s King. Discernment is not critical and extensive fault finding. It is about knowing righteousness, understanding of security and danger, discernment of wise and fool, differentiating right and wrong. Decisiveness is not ruthlessness and brutality. It is deciding and sticking, without any doubt, to the principle(Dao) such that it cannot be tempted by evil, changed by flattery. Benevolence without discernment is like having fertile field and yet not ploughing them. Discernment without decisiveness is like seeing the weeds among the wheats and yet not removing them. Dicisiveness without love is like only wanting to harvest(cutting out) without planting. Having all three leads to a strong nation. Less one leads to decline. Less two leads to danger. Less three leads to death. Since the beginning of man, there is nothing before nor has changed. Gain wealth to loose one conduct is not want I choose. Choose to follow and do the good and kind things will bring beauty back to self. The righteous does not change for life or death. The abilities of people differs. Different jobs have their specialization. 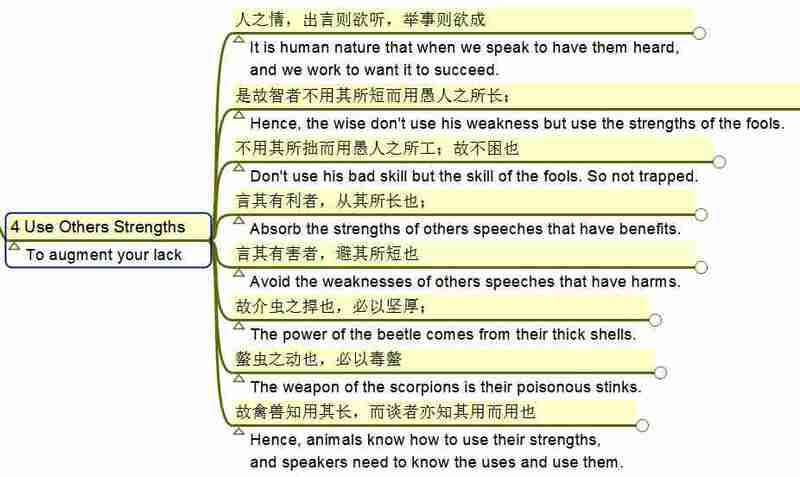 During the ancient times of Yao and Xun, the capable people stayed in their specialty and changed not. If assign them here and there, change their jobs, then cannot reach excellence. Hence, leader with integrity can gain the best of the world and deploy them according to their strengths. Those that did well, rapidly reward them and don’t change their job. Punish in time. Severely punish those with wrong doings. This is like controlling the horses of a wagon, direction & speed. Demote or replace the under performers by able ones. Those with faults then punish or kill without mercy. If goodness is not rewarded and evil is not punished, the good ones will be lazy and the evil ones diligent. In the above mind-map, we can see that “The CEO Handbook” is just part of a larger framework, covering only the ‘People’ factor. There are other factors listed by the Art of War. 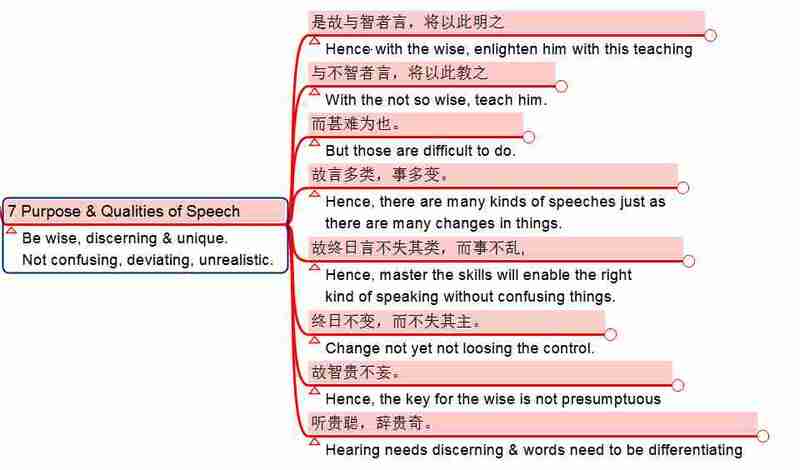 On the left side, we see the origin of Chinese Philosophies, the Book of Change, also known as I-Ching. Success is the desire of everyone. Having a Multi-Brain Whole-Man(MBWM) mindset is a key for people to know how to achieve it. So, I use this “Rule for Success” as a case study to help introduce the MBWM mindset that will hopefully help you to attain the success that you want. We all know that “exercise is good”, but many are still not exercising regularly. Why? Because the fact (‘Exercise is good”) only enters our mind and not our heart. We don’t feel it is important enough for us to do something about it. Our heart is not fully persuaded. We make excuses like “I don’t feel like it now”, “I’m too busy now”, etc and the best excuse of all, “I’ll do it tomorrow”. So we know that any behavior change or improvement, must address at least two parts of our “Whole-Man”, namely the mind and the heart. If we have friends, the relationship part, then perhaps our friends can encourage us and even force us to join them in their exercises. So now we have our mind, heart and relationship that trigger us to get our body to go out and exercise. This is the concept of Whole-Man mindset. One of the key part of the Whole-Man mindset is the MIND. To help us develop our MIND, I introduce the Multi-Brain model making up of rational Left-Brain, creative and intuitive Right-Brain, the Digital-Brain of the computer, software and knowledge bases and the internet collaborative Cloud-Brain of the millions of people of the world. Left and Right Brains are well covered in the literature or in the internet Cloud, and I shall not cover anymore except to remind us that we should not be fooled into thinking that we are either a Left or a Right Brain person. We have both and should develop and use both Left and Right Brains. I have intentionally show the mind-map to above to show that we can use computer and software to extend our biological brains. The digital brain serves as our brain or mind extender. We must develop our extended brain —- our Digitial Brain. For more information on how to develop our digital brain, please see Thinking Frameworks, or at least the series on mind-mapping starting with Brain Storming with Mind Mapping – Illustrated with Future of Singapore. These are the great wisdom from the crowd of successful people available in the internet Cloud Brain. It will be too much to digest, remember and to recall. 1. 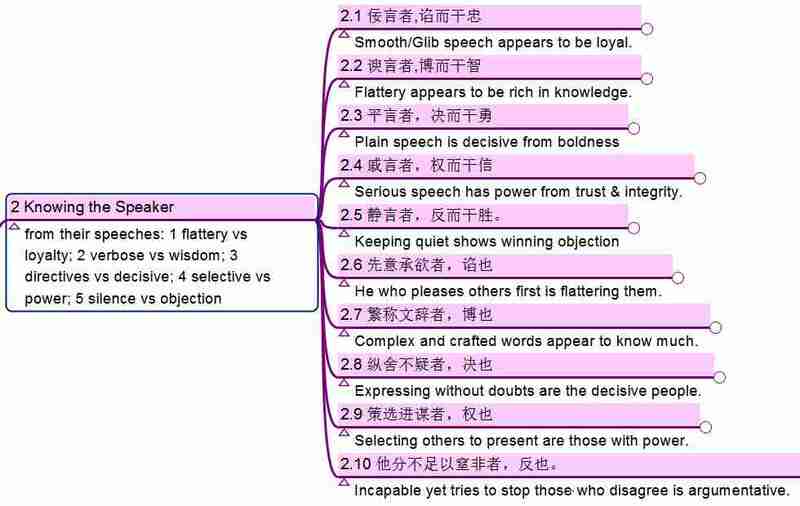 Copy & Paste or Retype the Key Words into the Mind-map. 2. Read the articles refered and try to make the article title more meaningful. For example, the first article title by Evan is just “Do Less”. If we read the article, we get to know more. He is talking about doing less so that we can focus on the key thing (something that Steve Jobs also said in “Say No to a 1000 thing”). Furthermore, he said to follow our gut! His success in Blogger and Tweeter are subsets of his main thought that he felt have great potential. These keys are important. So I change the title from “Do Less” into “Do Less – Importance of Focus & Follow Your Gut”. Of coure, you are free to shorten it to whatever that help you understand and remember better. So a shorter title might be “Focus & Follow Your Gut”. But I prefer ‘Do Less’ because that is what focus means and ‘do less’ is a great reminder for us who naturally want to ‘Do More’. 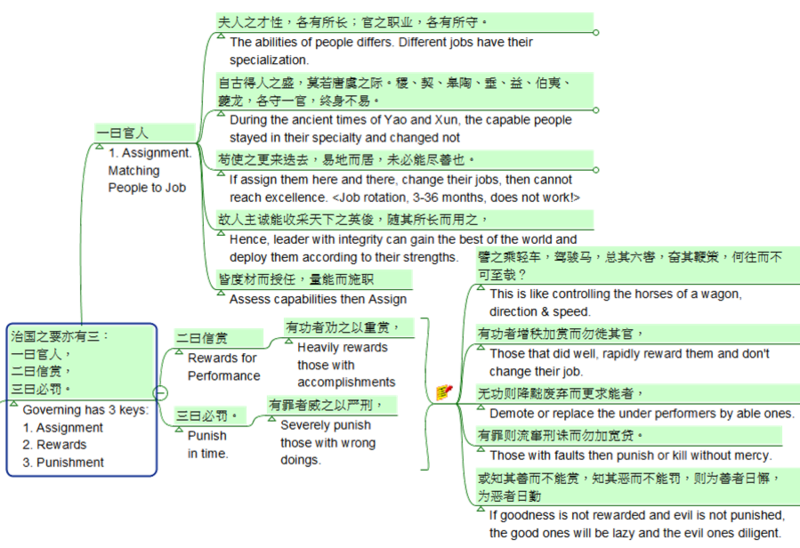 I spent the time to read all the articles and rephrase the titles shown in the mind-map above. You can then color, number and format the map in whatever way you like to make it appeal and easier to understand. 4. 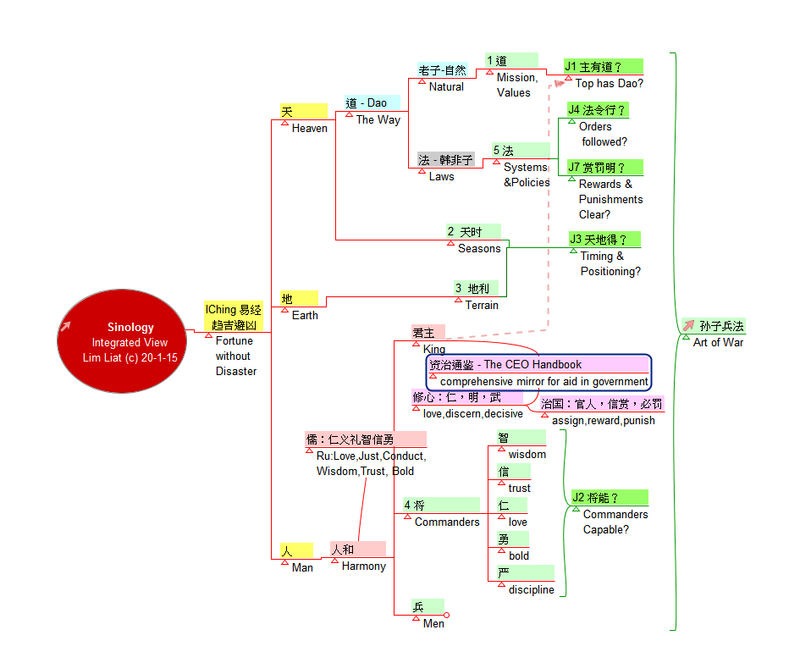 Link it with Existing Mind-maps. This is not the first time we look for the secrets of success. Most likely, we have read many quotes and stories of the rich, famous and successful people like Steve Jobs, Bill Gates, Stephen Covey etc. That was what I did and have shared it in Integrated Success Principles – Adding the 5 Secrets of Richard Branson. 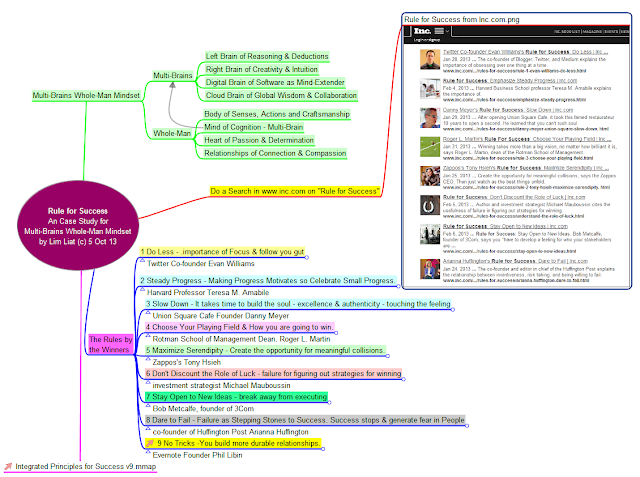 So I put link in this mind-map to the “Integrated Success Principles”. In fact, I have go one-step further to integrate this one into the larger “Integrated Success Principles” mind-map. When I do that, I will discover there are many duplicates and there will be some new thoughts. This is how an existing mind-map of knowledge grows with time. 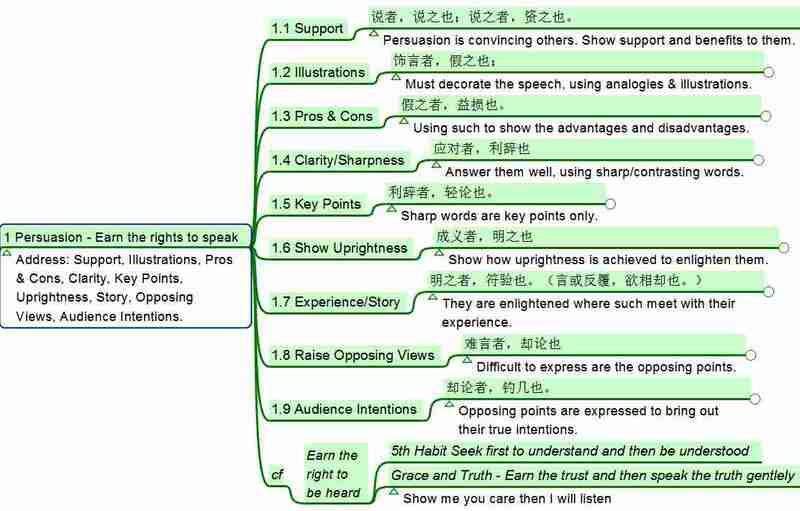 I have went to the mechanics of building a mind-map for success principles. 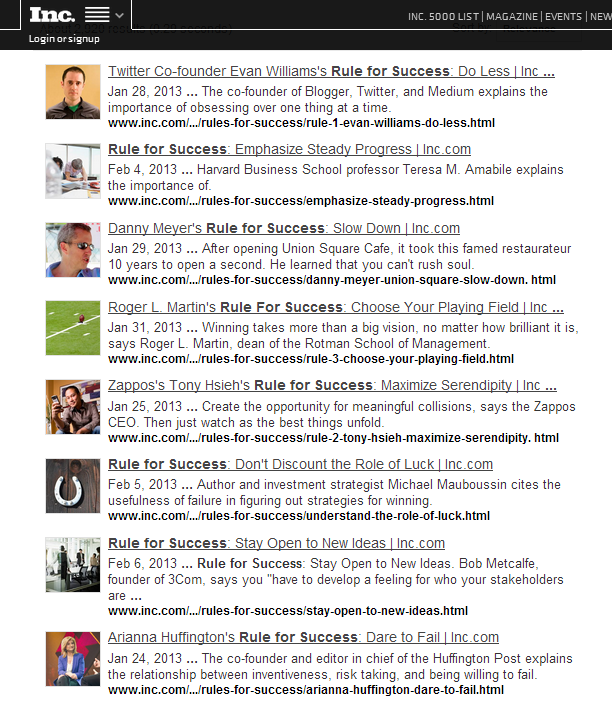 Don’t forget to read the content of the “Rule for Success” and see if you can learn something from them. All the very best to your success. See also: Map Your Way to Greater Success from the Keys of the Super-Rich. 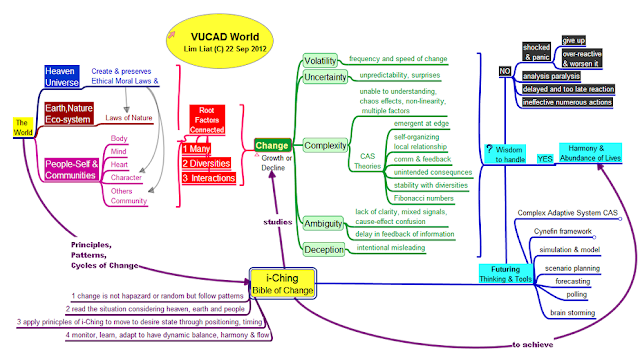 21st Century World is characterized by VUCA of Volatility, Uncertainty, Complexity and Ambiguity plus Deception (VUCAD). Successful living calls for a new mindset. The world-view of the factors, causes and proposed solutions are shown in a Visual Model. But surprisingly the wisdom that you need is not new but originated 5000 year-ago in a book called i-Ching, meaning, the Bible for Change. Applying the wisdom will lead to you the objective of harmony and abundance making up of diversities of people, races, cultures, living things in nature and in the universe. Alvin Toffler, “The illiterate of the 21st century will not be those who cannot read and write, but those who cannot learn, unlearn, and relearn”. So what do we need to unlearn and relearn? The mindset of the 19th century industry age is deterministic cause-effect, which is still the mindset of many people today, even those in the government, the engineering and the scientific mindset… symptoms of the one best answer, cockiness, which we now call them presumptuous. The mindset of the 20th century, thanks to quantum and statistical theories, is a probabilistic world with predictability. We understand variation, standard deviation, and we only jump when things are outside the control limits. E W Deming’s A system of profound knowledge is a must read. It covers four areas of an appreciation of systems, understanding of variation, theory of knowledge, and psychology. 3. The VUCA World – What shall we do in this seemingly mess? The mindset of the 21st century, the hot term in this week seminars, is VUCA which stands for Volatility, Uncertainty, Complexity and Ambiguity. VUCA comes from the US Military awhile back but is new to the management gurus. Some military literature have it as VUCAD, with D standing of delay in the feedback of information from the confusing raw data. But I would like to change the D to represent Deception. In the VUCA world, delay is implied. However, in this modern world of spam, hoaxes, outright sabotaging, it is important to recognize intentional Deception and be not deceived. The key is how do we live successfully in this VUCA world? 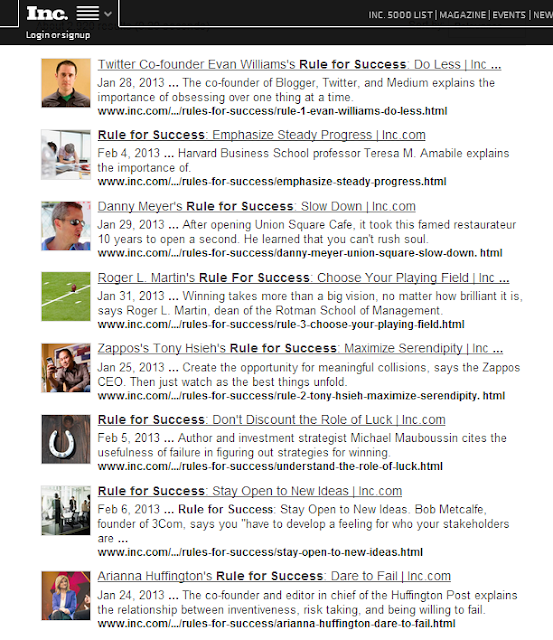 Do a google on VUCA and see the articles on how to, especially on leadership. Start with this HBR article for example, http://blogs.hbr.org/frontline-leadership/2010/11/leading-in-a-vuca-environment.html. The are books that address this issue such as Strategic Speed: Mobilize People…, Leaders Make the Future: Ten New… etc. 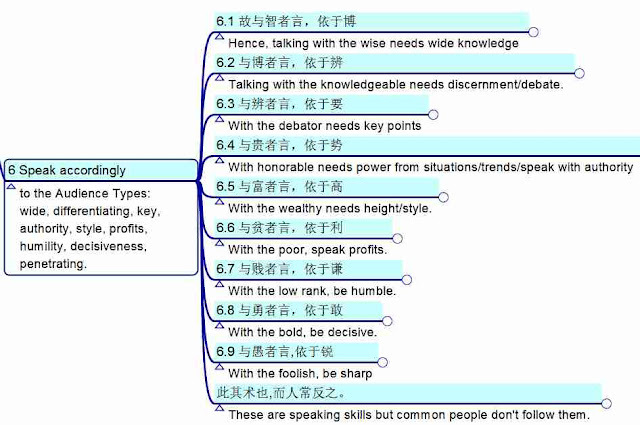 But the BIGGGGG SURPRISEEEEEEEEEEE, the leadership advices from the above articles and books are only a subset of the wisdom of I-CHING, the “Bible for Change”. The unchanging principles of i-Ching is a good guide for us to live in this VUCA world. To read more about i-Ching, see http://mind-value.blogspot.sg/2012/05/making-i-ching-come-alive.html. Hope you like it and please share your advice with us. 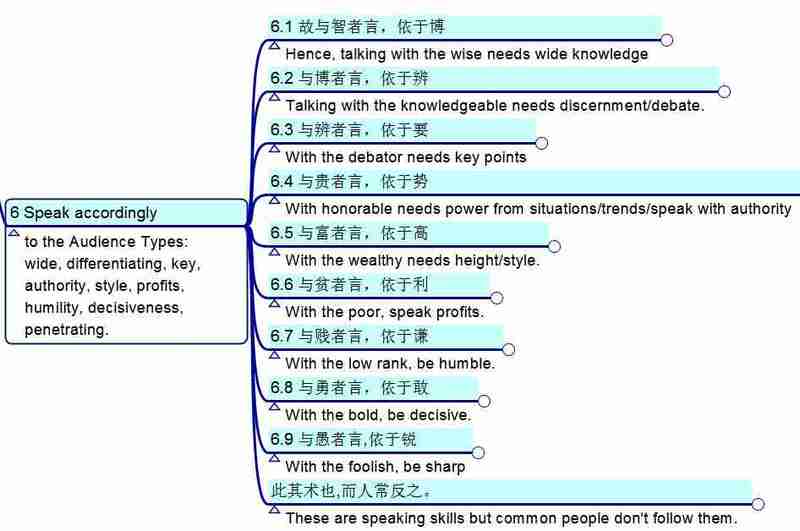 I-Ching for Success in the VUCA World.